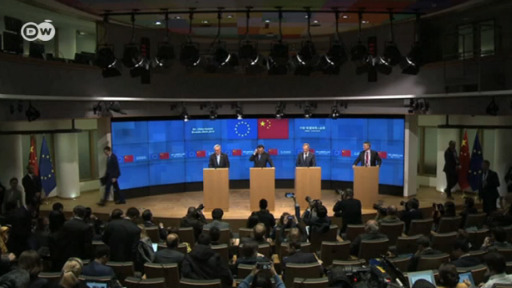 The European Union and China pledged to strengthen their trade relationship and work towards opening up China's economy for foreign investors at a summit in Brussels on Tuesday. The annual summit comes a month after the European Commission branded Beijing a "systemic rival" over what they said were unfair trade practices, and amid an ongoing US trade war with China. A commitment toward "broader" and "non-discriminatory" market access, in wording that the EU saw as a shift from China on opening up its economy. On surrendering intellectual property to gain access to China's market, both sides agreed "there should not be a forced transfer of technology." Increase efforts to strengthen international rules against state subsidies for industries. Speaking after the summit in Brussels, Chinese Prime Minister Li Keqiang said that European companies will enjoy "equal treatment" in China. "We will not treat EU companies, especially those registered in China, with discriminatory policy, including solely foreign-owned companies in China," Li said. "And likewise Chinese companies should not be discriminated against in their operation in the European Union, he added. European Council President Donald Tusk hailed China's signing of the joint statement as a "breakthrough," particularly Beijing's commitment to strengthen rules against industrial subsidies. "This is a breakthrough. For the first time China has agree to engage with Europe on this key WTO reform," Tusk said. Politicians and businesses in the EU and the United States have criticized China for forcing foreign companies to hand over intellectual property in order to gain access to China's economy — which is the second largest in the world. Beijing has repeatedly pledged to open up its economy to foreign companies and investors, but critics say that China hasn't done much to fulfill this promise. As US President Donald Trump's administration is currently embroiled in a trade war with China, Washington has also been pressuring Brussels to take steps against Beijing. Most notably, the US has urged the EU to ban Chinese tech giant Huawei over the company's alleged ties to state security. High stakes talks: The EU is China's biggest trading partner, with two-way trade between the bloc and China worth around €575 billion ($648 billion) annually. The stakes were high for the EU as well, as China is the bloc's second-biggest trading partner, coming in only after the US.